Improve emergency room care for children with croup by reducing the parent’s anxiety through education about the virus’ effects and treatment. Watching your young child struggle for breath with croup is a terrifying experience, but it doesn’t need to be. Keeping you and your child calm through the experience is important because getting excited can make the symptoms worse. 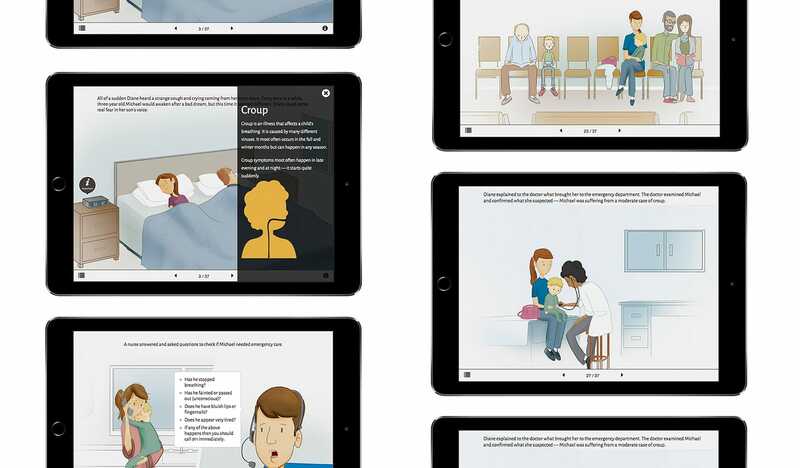 We created an interactive eBook and website delivered on tablets in emergency rooms. The interactive experience shows users exactly what to expect as they deal with croup from diagnosis to treatment. The eBook is fully illustrated in storybook format making it accessible to parents and children so they can learn and stay calm together. 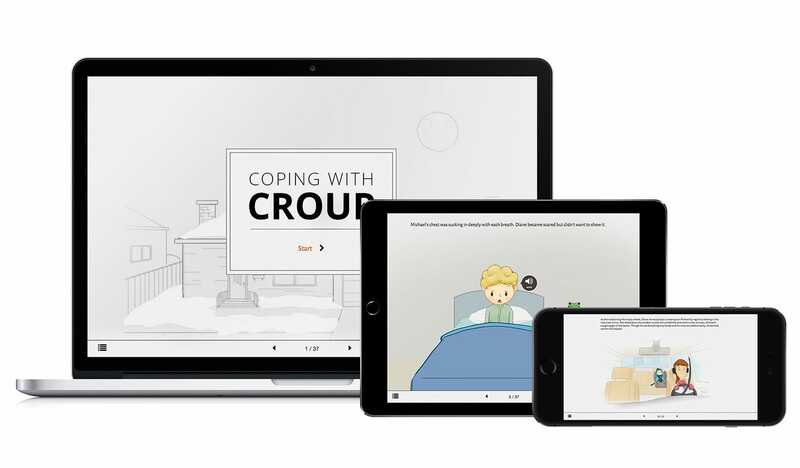 The resource is based on a series of croup storybooks previously researched and developed by TRanslating Emergency Knowledge for Kids (TREKK). We re-imagined the books in an interactive digital format to improve distribution (parents can access them online from any device) and to more effectively evaluate their effectiveness. The interactive eBook and website were successfully delivered. They’re currently undergoing evaluation in emergency rooms across Canada. A growing network of researchers, clinicians, national organizations and health consumers who share the same goal – to improve emergency care for children across Canada. The Institute offers hope to children and their families, as researchers work towards medical breakthroughs and cures for childhood illness. CHRIM is the only research institute dedicated exclusively to pediatric research in Canada’s Prairie Provinces. At the Institute, over 270 world-class pediatric medical researchers, technical staff, students and support staff are involved in over $10 million of research and clinical trial activity each year.